Fit-Ink: How Are You Getting Over That Hangover? Aside from the promise of warmer weather this weekend in the Windy City, the weekend before St. Patrick's Day typically means dragging out the green tees, Kiss Me I'm Irish pins, and hunting for green beer and Irish grub in between drunken debauchery and parade partying. Chicago holds two popular parades, one downtown and one on the south side in Beverly, and this year both happen to fall on the same weekend. Talk about a double dose of drinking with an equally daunting risk of hangovers come Monday morning--and to only start again when the true St. Patty's Day rolls in on Tuesday. But did you ever think a drink typically sipped by athletes could help cure a hangover? I definitely didn't...until I spoke to the founder of Zym the other day. Brian Koff, founder of the product local to Chicago but available to all online at gozym.com, taught me more than a thing or two about his product. And talk about making a sale for the greenest holiday of them all. Zym, with its catchy green tube and lemon-lime endurance formula, is just asking to tag along to all the St. Patrick's Day festivities. It's convenient to carry and its combination of electrolytes and B vitamins--remedies for a hangover according to health911.com--can be just what the body needs after heavy imbibing. 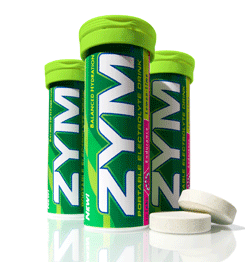 Zym also boasts effervescense, low calories and a light flavor to add spark to that plain glass of water. Pop it into your Nalgene before you're off for the day and you could whisk that headache away before you even arrive at the office (that's what some claim at least). It might just save you and your Irish holiday. P.S. Check out more interesting info on sports drinks and tablets as we gear up for the upcoming outdoor season...spring is springing!